Image caption Where did our food go wrong? You may have seen the recent outrage over Time Out London's seemingly innocent video about "exploding dumplings". 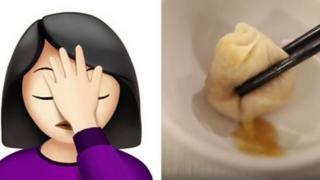 The travel and lifestyle organisation was criticised by foodies for "manhandling" traditional soup dumplings, known as Xiao Long Bao, literally, little basket buns. In the one-minute video, diners were shown bursting their baos with chopsticks and, much to my horror, throwing away the soup. Any Xiao Long Bao enthusiast knows you are meant to eat them in one go, even at the risk of scalding your mouth from the broth. Time Out London said its intention was just to show viewers "the visual treat of the broth that is tasted but not seen". It even extended an olive branch with a public blog post asking food lovers of Asia for culinary advice. Asia is a continent of fierce food lovers, and this is not the first time a foreign misunderstanding of our culinary heritage has caused uproar. Here are some more examples of when beloved dishes went wrong. Mention Pinoy cuisine and you'll think of Halo-halo, a colourful dessert of shaved ice and evaporated milk with boiled sweet beans, coconut, sago, jelly, tubers and fruits added to the mix. What could be more Filipino? Thanks (or no thanks) to a group of US chefs, the legendary delicacy soon reached America's most famous music and arts festival: Coachella. Much to the dismay of Filipino foodies everywhere, the Coachella version was gluten-free and vegan. It was given a hipster twist, with fruity pebbles cereal, soft tofu and gasp, Red Bull added to it. "The 'Halo-halo' they had at Coachella makes me sad because that's not Halo-halo," cried one Twitter user. "In other news, Coachella just bastardised Halo-halo by serving it drenched in Red Bull instead of milk," lamented another. Are you ready pho this, Vietnamese aficionados? Los Angeles restaurant Komodo paid tribute last year to Vietnam's national dish by merging slices of beef, vermicelli rice noodles, bean sprouts, herbs and hoisin sauce into a burrito it dubbed a Phoritto. For an extra spicy kick, it also added jalapeños. The creation shot to popularity thanks to an Insider food video, generating more than 157,000 Facebook reactions and 335,000 shares. The dish was not as controversial as Coachella Halo-halo and exploding Xiao Long Baos. It actually got rave reviews. "The ingredients of a bowl of pho wrapped in a tortilla, without the broth. The perfect fusion of Vietnamese and Mexican cuisine," wrote Binhtri Vu in a Facebook review. "I've had pho before, ate it in different parts of Vietnam so I can honestly say that I have plenty of experience." But one simply does not mess with Vietnam's national dish. Not according to rants on social media. "No-one can convince me that the phoritto is a good idea," said Huong Nguyen on Twitter. "They've gone too far. It's not pho if there's no broth, that's the best part. Don't murder a staple of our country for your own selfish commercial gain," said another outraged foodie on Facebook. Komodo, by the way, is in neither Mexico nor Vietnam, but an island in Indonesia. Are you listening, Tyler Akin? The owner of a Philadelphia-based pho restaurant incurred the wrath of a nation of pho lovers by telling them how to "get the most out of" their national dish. The video titled, "How to Eat Pho" racked up over 1.2m views with even more negative comments from angry Asians who grew up eating the delicacy. "When people come in and immediately squirt Hoisin Sriracha sauce, it completely destroys the decisions we make about the soup. I do not put sauce in my soup," the US chef said in a running commentary that was rebutted by many diners, who pointed out that they enjoyed hot sauce, particularly with their beef slices. "Hey Vietnamese people, guess what? We have been eating our pho the wrong way," said Facebook user Klot Kleng Dong. "This is coming from a white boy trying to culturally appropriate our comfort food. First of all, adding Thai basil is a preference and so is the Sriracha and hoisin sauce." It's Hell's Kitchen, turned around. Back in 2009, British celebrity chef Gordon Ramsay got torn apart by a renowned Thai chef on an episode of his popular television series The F-Word for serving up less than perfect Pad Thai. "This is not Pad Thai at all," Chef Chang admonished. "Pad Thai has to be sweet, sour and salty." Ramsay did try to save himself, saying that his dish tasted "pretty good". But Chang wasn't having any of it. "For you maybe, but not for me." For an accurate verdict, I consulted my colleague Thanyarat Doksone in Bangkok. "Of course everyone wants to try everything Ramsay cooks. But I'd personally rather go for a Pad Thai joint on the streets of Bangkok to get a more authentic taste." Does Singapore really need a Michelin star guide?